Production: Bioskop Film; Fujicolour, 35mm; running time: 107 minutes. Producer: Eberhard Junkersdorf; screenplay: Margarethe von Trotta; assistant director: Helenka Hummel; photography: Franz Rath; editor: Dagmar Hirtz; sound: Vladimir Vizner and Hans Dieter Schwartz; art directors: George von Kieseritzky and Barbara Kloth; music: Nicolas Economou; costumes: Monica Hasse and Jorge Jara. Cast: Jutta Lampe ( Juliane ); Barbara Sukowa ( Marianne ); Rudiger Volger ( Wolfgang ); Doris Schade ( Mother ); Verena Rudolph ( Sabine ); Luc Bondy ( Werner ); Franz Rudnick ( Father ); Julia Biedermann ( Marianne, age 16 ); Ina Robinski ( Juliane, age 17 ); Patrick Estrada-Pox ( Jan ). Awards: Golden Lion, Venice 1981.
von Trotta, Margarethe, Die Bleierne Zeit , Frankfurt, 1981. Kaplan, Ann E., Women and Film: Both Sides of the Camera , Methuen, 1983. Frieden, Sandra, Gender and German Cinema: Feminist Interventions—Volume II: German Film History/German History on Film , Oxford, 1993. Variety (New York), 16 September 1981. Nave, B., "Les années de plomb: Margarethe von Trotta ou le refus de l'oubli," in Jeune Cinéma (Paris), November 1981. Pellizzari, L., and others, "Speciale anni di piombo," in Cineforum (Bergamo), March 1892. Celemenski, M., and others, "Margarethe von Trotta," in Cinématographe (Paris), April 1982. Amiel, M., Cinéma (Paris), May 1982. Sauvaget, D., Image et Son (Paris), May 1982. Milne, Tom, Monthly Film Bulletin (London), June 1982. Johnston, S., Films and Filming (London), July 1982. Rabinowicz, L., "Dark Times," in Cinema Papers (Melbourne), August 1982. Sklar, R., and Harris, A., Cineaste (New York), Vol. XII, no. 3, 1983. Alemanno, R., "La prassi delle conoscenza in 'Anni di piombo,"' in Cinema Nuovo (Bari), August-October 1983. DiCaprio, L., "Baader-Meinhof Fictionalized," in Jump Cut (Chicago), February 1984. Delorme, C., "On the Film 'Marianne and Juliane' by Margarethe von Trotta," in Journal of Film & Video (Boston), Spring 1985. Seiter, E., "The Political Is Personal: Margarethe von Trotta's Marianne and Juliane," in Journal of Film & Video (Boston), Spring 1985. Kaplan, E. A., "Discourses in Terrorism, Feminism, and the Family in von Trotta's Marianne and Juliane," in Persistence of Vision (Maspeth, New York), Fall 1985. Donougho, M., "Margarethe von Trotta: Gynemagoguery and the Dilemmas of a Filmmaker," in Literature/Film Quarterly (Maryland), July 1989. Toiviainen, S., in Filmihullu (Helsinki), no. 5, 1995. Martin, Michel, and Maurice Elia, "Margarethe von Trotta toujours présente," in Séquences (Haute-Ville), November-December 1996. The German Sisters is based in part on the life of Gudrun Ensslin, one of the best known members of the Baader-Meinhof Group or Rote Armee Fraktion which carried out a campaign of terrorism in Germany in the late sixties and into the seventies. She was arrested in 1972 and sentenced to life imprisonment. In 1977 she and two other group members were found dead in their cells at Stammheim prison. The authorities claimed they had committed suicide, but this explanation has never been accepted by many, including Gudrun's sister Christiane, to whom this film is dedicated. In The German Sisters Gudrun becomes Marianne and Christiane becomes Juliane, the daughters of a pastor in the German Lutheran Church. As we see through a number of flashbacks, both grow up in an atmosphere which is at one and the same time patriarchal but socially liberal and concerned. It is also strongly anti-fascist. In childhood, Marianne is dutiful and well-behaved, and Juliane is the rebel. But in the film's present, Marianne has become a terrorist, whilst Juliane has decided to try to change society peacefully by embarking on what was known at the time as "the long march through the institutions" and becoming a journalist on a liberal women's magazine. As the flashback structure suggests, The German Sisters concerns the weight of the past on the present. Its original German title translates as "Leaden Times," which could be taken as referring either to the Nazi past (which has shaped, in quite different ways, Marianne's and Juliane's oppositional attitudes to the German present), or to the dreariness of the fifties in which they had their childhood and in which they were shaped by rather more personal forces, such as sibling rivalry and patriarchal authority. 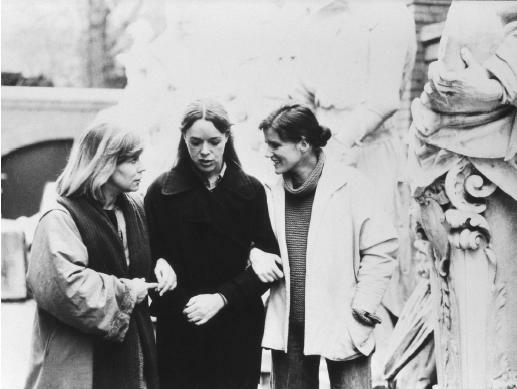 The film shows us two ways of relating to these pasts—violent rejection, or reformist feminism—and is, as Ellen Seiter has claimed, "an effective dramatisation of the feminist slogan 'the personal is political,' locating as it does the characters in their experience in the nuclear family within a specific historical, national and cultural instance." However, this is where the problems begin, since the film, dedicated to the real-life Christiane, and told very much from the fictional Juliane's point of view, does undoubtedly privilege reformism over terrorism. (Of course, had it done the opposite it wouldn't have got made in the first place.) Especially problematic is the fact that, since all but one of the flashbacks concern the sisters' childhoods, we have no idea why Marianne joined Baader-Meinhof in the first place, nor do we learn anything about the group's ideology and its reasons for choosing the terrorist strategy. Given this lacuna one is almost bound to look for the explanation for Marianne's actions in the carefully delineated family circumstances in which she grew up, and to fall back on the psychoanalytic suggestion that "Marianne's blind devotion to her father, as against Juliane's resistance and identification with her mother, has made her susceptible to a new form of fanaticism." But, taken in association with Juliane's accusation that "a generation ago and you would have become a member of the Bund Deutscher Madchen" (a sort of Nazi version of the Girl Guides), this simply suggests that certain family structures produce members who are attracted to terrorist organisations and that there is thus no real fundamental difference between Left and Right wing terrorist groups (see for example Gillian Becker's Hitler's Children , and Helm Stierlin's Family Terrorism and Public Terrorism ). Radical politics, Left or Right, are reduced to rebellion against the authoritarian father, Juliane is a model of responsible, social-democratic oppositional politics, and Marianne epitomises fanatical, pathological rejectionism. Whilst there is some truth in these charges, they don't entirely do the film justice. It's true that, whilst she is alive, Marianne frequently comes across as pretty unpleasant. But this impression is mitigated by the flashback scenes, especially those in which she watches film of the concentration camps or of American atrocities in Vietnam, in which we begin to understand what might lead a socially-conscious young woman down the path from protest to terrorism. Furthermore, there is a sense in which, as Ann Kaplan has suggested, "it is tempting to read Marianne as some kind of 'double' for Juliane—the repressed self that Juliane wanted to be." This is most evident in the Persona — like scene in prison in which, thanks to the glass screen between them and the way the scene is filmed, Juliane and Marianne seem to fuse together. But it's also there throughout the latter part of the film in which, suspecting murder, Juliane absorbs herself totally in reenacting Marianne's death. She also thereby comes up against the real brutality of the German state, and gets an inkling of what confirmed Marianne in her hatred of and total opposition to it. At the end of the film, Juliane takes in Marianne's son Jan, who had been fostered when she was on the run and then in prison. The fact that he has been badly burned by children who found out that he was a terrorist's son suggests a cyclical pattern, with parents' deeds being endlessly revisited on their children. On the other hand the fact that he asks to be told everything about his mother, having earlier ripped up her photograph, suggests that Jan will not reject his parents like Marianne rejected hers. However, as Kaplan notes: "The act locates what is important firmly in the realm of the interpersonal. The vision is bleak in terms of bringing about change in the public realm." In this she is echoing von Trotta herself: "Hope arises from the realisation that you have to find the way back to yourself. This is less of a rallying call than a pessimistic statement. Personally I see very few chances of exploding the power complex established by the alliance between economics and science and, above all, I see no movement on the present political horizon capable of achieving this."